The Motherhood Mantra Every Mom Needs to Hear: You're an Amazing Mom! Truly, You're Doing a Fabulous Job! No matter if you use cloth diapers or disposable diapers, work full time or stay at home all day, cook for your children or take a family excursion to a different restaurant every day, you are an AMAZING mom! Don't ever let anyone else tell you otherwise. Don't let the Super Mom fool you, the June Cleaver look-alike intimidate you, or Perfect-Mom Syndrome get to you. As long as you love your kids the best way you know how, you are an all-star mom. How do we know? Still don't believe us? Look at our list below as you take a trip down parenting memory lane and reminisce on some of the loving things you've done for your children. (Feel free to share your experiences and memories in the discussion section below!) If you've ever done just one—only one!—of these things, you're a pretty amazing mom. Your family woke up late. Oops! You forgot to pack your child's lunch, but you a.) gave him some lunch money on his way out the door b.) delivered his lunch later that morning at school or c.) chased after the bus to hand over a quickly-packed lunch. Your little one's sick again. You've rubbed her back while she has a tummy ache, given her a bath to soothe the aches, or unwrapped a popsicle to help relieve a sore throat (or at least helped lift the spirits with a yummy-tasting cold treat). Your grade-schooler fails to tell you she is in a play, musical, or dance performance. You stayed up later than usual to sew her costume, or took it to the dry cleaners to whip it up in a jiffy! Even though you had another engagement or you were a tad late, you made it to a school function or mother-daughter tea party before it ended! Your son's gerbil is sick (or is on his last leg?—you can't tell). You stayed up late to nurse your son's little hamster, goldfish, or cat back to health, comforted him when it was time to say goodbye, or brought home a new puppy! A thunderstorm, scary movie, or monster under the bed makes for a middle-of-the-night visit from one or more children. You allowed them to all pile into your bed (just this once! ), or brought them back to their own and stood guard as they fell asleep safe and sound. You surprise them with a fun getaway to swim in the pool, visit a theme park, go camping, or play board games in a cabin. No laptop or cell phones invited! You put all errands on hold to go on a rampant search for a lost teddy bear, blankie, Gameboy, or doll. Whether you found the misplaced object or not, you replaced the well-loved item or found a way to make the tears go away. It's bedtime. You've tucked them in with a kiss on the forehead and an "I love you!" whenever you're home to do so. The list above was inspired by Marianne Richmond's Oh The Things My Mom Will Do…, if you enjoyed reading through, you should definitely check out the personalized edition and share with your kiddos! Being a mom is a pretty extraordinary role—and it's not always an easy one, but it's a rewarding and exceptional one. Did any of the above scenarios spark any memories of a few wonderful things you've done for your children? Moms do all kinds of crazy (and not-so-crazy) things for their children and families, and it's truly remarkable. To All Moms Everywhere: You're the perfect parent just the way you are! You're loving your kids, caring for them, and walking alongside them every day the best you know how! You're doing enough; more than enough! Give yourself a break!But also, make room for special bonding time with your children that isn't scheduled. Come to terms with the fact that it's inhumanly possible to do everything perfectly. Be OK with failing! Laugh at your imperfections and celebrate your small (but big) accomplishments as being a mom. Don't get too wrapped up in your to-do list. It isn't going anywhere and you can always come back to it. Don't let what society has defined as motherhood overwhelm you or place unrealistic demands on you. Be you and be proud! Don't let Super Mom intimidate you or passive aggressively tell you how to parent. Instead, go confidently in your own parenting skin…because you're doing a fine job already! Always remember, you're a good mom! You're a fabulous mom, in fact! And we all know this is true: you'd do anything for your little ones! Anything else to add to our list(s)? We love comments! All books can be customized to include your child's name and photo, and a special note on a dedication page. I Love You So... puts into words the often indescribable quality of boundless, steady and unconditional love between a mother and her child. What is love to a child? 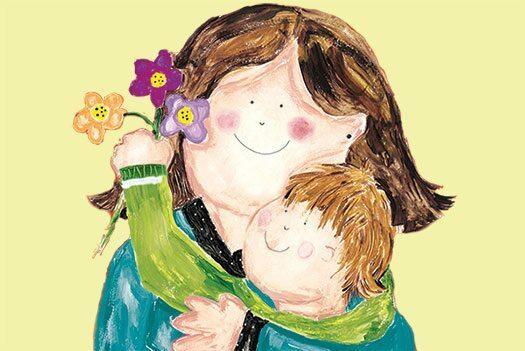 This beautiful personalized book from author Laura Duksta shows what love looks like to both a parent and a child, and will become a family favorite. Personalize this adorable story to show your little one how you'll always be together—no matter what—within each other's hearts. Illustrated in watercolor with pastels and soft tones, I'll Never Let You Go is a wonderful story about growing up and letting go, while holding on with all of your heart.